Being a modest person, I don’t like to be in the spotlights very much. I’m not too fond of presentations, sketches at wedding parties or karaoke. At birthday parties (if I go at all), I don’t feel the need to tell the most amazing story you’ve ever heard, or the funniest joke you can imagine. I guess, well no, I’m quite sure, I’m more an observer than a performer. Nothing wrong with that, I’d say, the world needs performers as well as observers. However, all observers need to perform sometimes, and all performers need to observe every now and then. As a freelance worker I also have to stand out somehow, for potential clients to learn about me, or recruiters to offer me assignments. Not so easy, as there are thousands of consultants like me, how do I show the world that I’m the one you need? My own area of expertise is IT, so standing out on the Internet should be the least to strive for. I’ve got my own website since 6 years, renewed it completely recently. According to LinkedIn my profile strength is almost All-Star like. I don’t know what that means exactly, I thought All Star is for basketball players, but at least I can associate the word “star” with standing out, so it must be a good thing. 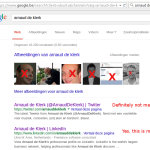 Next thing, let me google myself, see how I’m ranked by world’s leading search engine. First hit: Twitter account of someone that goes by the exact name as I do (as far as I know, there are only two persons in the world that go by my exact name). Google’s description line of this hit: “Nerd met een voorliefde voor muziek, concerten, (uit) eten en borsten!” (translate this). Not me. Not good. Not good at all! All right then, clear. Time for some serious self marketing, and more specifically, spoken in terms of Internet marketing: time for some serious self SEO (for those who don’t do self marketing: Search Engine Optimization)! 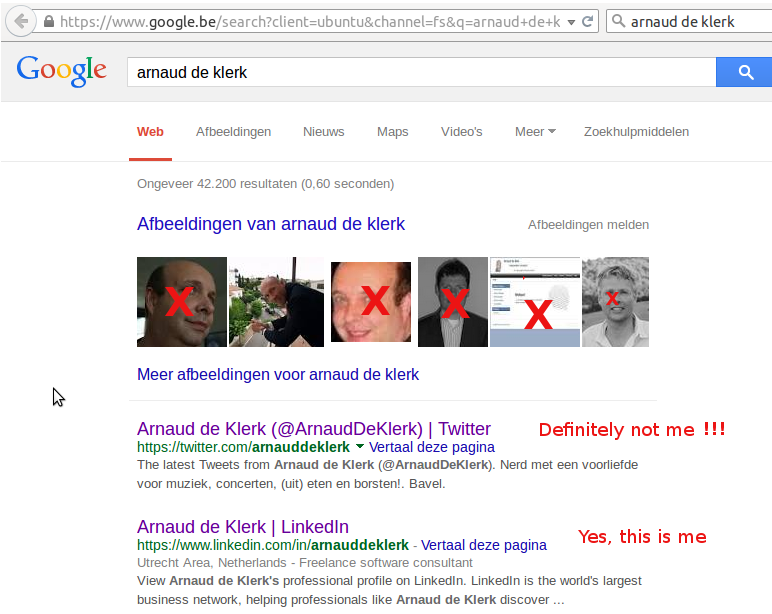 Within a few weeks, I’ll have to be at the top of the ‘Arnaud de Klerk’ Google’s search action, with a serious line of information about me, that’s for sure! This entry was posted in SEO on 05/04/2015 by admin.